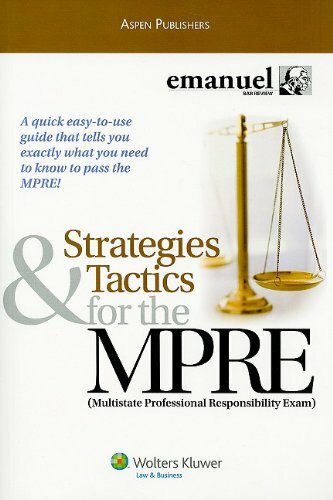 The Multistate Professional Responsibility Examination (MPRE) is a 60-question, two-hour-and-five-minute, multiple-choice examination administered by ACT, Inc., on behalf of the National Conference of Bar Examiners (NCBE). The examination is administered three times per year (March, August and November) at established test centers across the country. The purpose of the MPRE is to measure the applicant’s knowledge and understanding of established standards related to a lawyer's professional conduct. For MPRE Registration Information, go to www.ncbex.org. If you have questions regarding the MPRE, please call 319-341-2500. E-mail mpre.registration@act.org for registration information or mpre.score@act.org for scoring information. The MPRE is required for admission to the bars of all but four U.S. jurisdictions. Passing scores, which are established by each jurisdiction, currently vary between 75 and 86. Since the requirements for accepting an MPRE score vary from one jurisdiction to another, check with the board of bar examiners in each jurisdiction to which you intend to apply before completing the application materials. Examination results will be forwarded to one jurisdiction of your choice and will be kept on file at the office of the National Conference of Bar Examiners in Iowa City, Iowa. Applicants who have taken the MPRE and achieved a scaled score of 75 or higher should contact the NCBE at www.ncbex.org, to have the score forwarded directly to the Office of Bar Admissions. The Board of Bar Examiners does not accept MPRE scores forwarded by applicants. Applicants who have yet to take the MPRE must make arrangements with the NCBE at the time of the administration of the MPRE to have the score forwarded directly to the Office of Bar Admissions. Passing MPRE scores must be RECEIVED in the Office of Bar Admissions by 4:30 p.m. on the published deadline. The scores must be received no later than January 15 for the February Examination and June 15 for the July Bar Examination. You will receive an email notification to verify the receipt of transcripts by the Office of Bar Admissions, please do NOT call the office to request this information.